Why did you decide to go on the Yanayacu Research Trip? 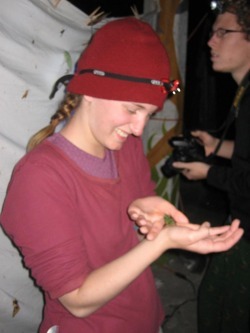 I always wanted to be an entomologist, since I was 11, that helps discover new species. I wanted to travel and visit the rainforest and I got to work as an REU. What was the most important thing you learned? How to cooperate with other people and respecting others insight. How has this experience changed you? I have a better perspective of how diversity works. I learned how large groups of people can work together. What are your plans for the future? I want to be an entomologist. What advice would you give a young scientist? Always be inquisitive. Whenever an idea pops into your head, ask about it. Take advantage of opportunities as they come.